I showed you some inspiration pictures for a draped skirt and I enjoyed your feedback – thank you. 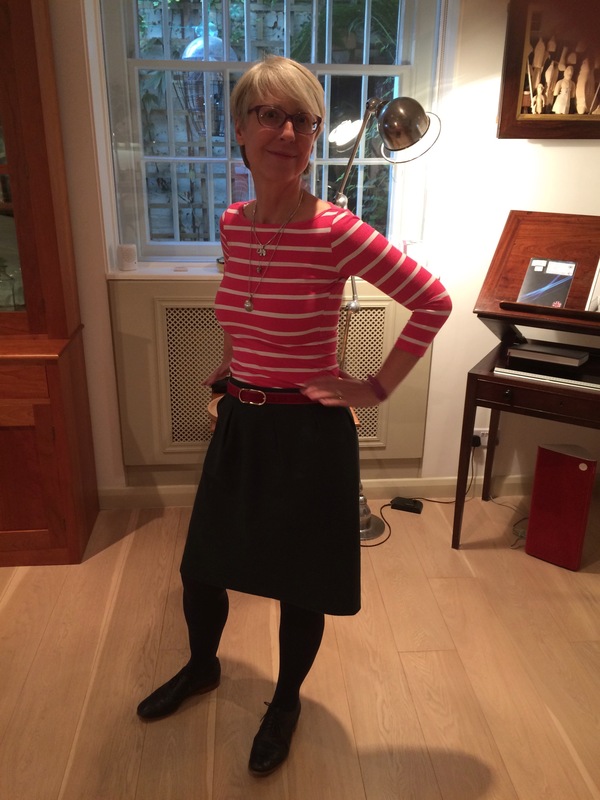 I went to my evening class wearing the skirt I had made up from last week’s pattern. The inside picture is a little bit dark I am afraid. This skirt was an interesting experiment for me. I used a straight length of cloth. I cut off sufficient fabric for the waist band along the selvedge edge, then measured the width of my hips plus a little ease. There was no side seam and just a CB seam, with zip. I suppressed the fullness into three small darts each side of the zip, and three pleats to each side of the CF. I trimmed a little fabric from the waist to ensure it was neat before adding the lining and waist band. Very simple to make and virtually no waste. If you have limited fabric – just enough to circumnavigate the hips – this saves on taking in two side seams. I have used it before with a nice piece of leather to reduce the waste. When I got to the class I had another idea in mind. A deconstructed four gore skirt. I tore out four rectangles of fabric, two which measured from princess line to princess line (at hip level) on the stand. And two more that were wide enough to span the back to front princess lines. I then played around with them until I had an artistic placement. While this is artistic it is also impractical. 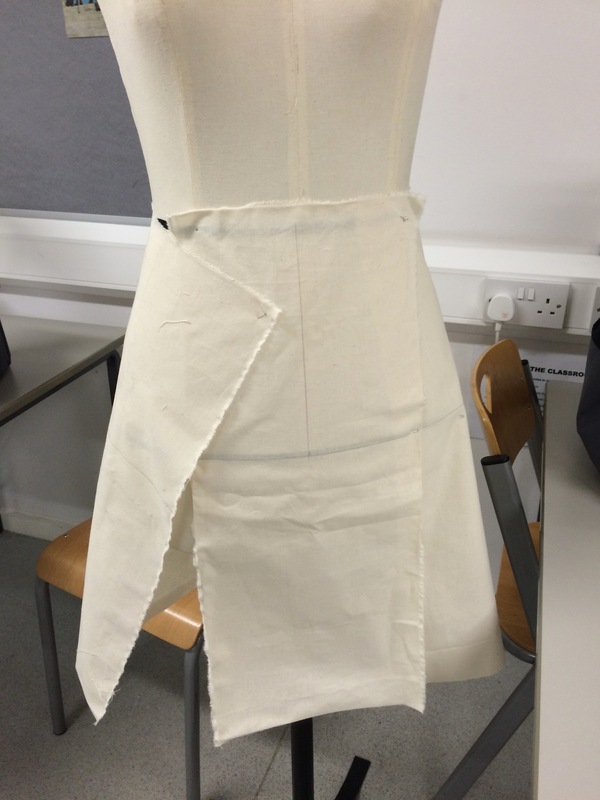 We have created an A line skirt but the gaps that opened up needed to be “filled in” if we are to create a wearable skirt. I removed the pattern from the stand and added fabric with the same grain to two of the pieces to provide the “background” pieces, spanning both the CF and CB. This meant that two of the rectangles (which create the sides of the skirt) remain exactly as I started. I arranged them so they overlap the background pieces. At the moment I am thinking that the skirt will fasten along the left front princess line with perhaps a row of buttons. I am also considering doing the skirt in different fabrics so that the piecing is obvious. I transferred the four pieces onto paper and marked the sewing lines. 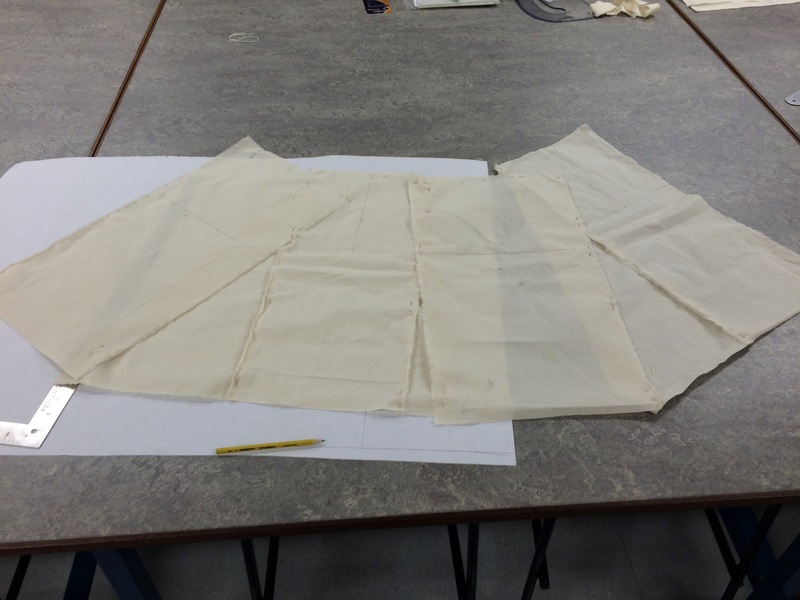 In terms of construction I was inspired by this Topshop skirt which has unfinished seams. What do you think? Love your one seam skirt. I’ve seen similar with a dart being used at the top of where the side seam would be, another place to dart out the waist fullness. Great job. Gosh I don’t know if I could embrace the unfinished seams like that. I do like the idea of the skirt from very limited yardage. I do have a single leather skin, but the Burda magazine patterns which use leather always seem to need multiple skins. I like your skirt and love your creativity. I’m not keen on the Topshop skirt, largely because it’s not well made but that wouldn’t be an issue with yours. I guess, as with any make, it would depend on the fabric used. I’ve seen some great unfinished seams. The TopShop skirt’s construction doesn’t appeal, but with the right fabric the unfinished seam look can be good, as others have commented. Their’s is basically a straight skirt, your toile so far is coming up as a slight A line. They have eliminated waist shaping by dropping the front wrap over (effectively transferring it into the drop). You’ve transferred at least some of the waist shaping into the hemline, so there are already some significant differences. I’m looking forward to seeing what you come up with now. Thank you for a beautifully clear explanation Jay of what is going on here – I sometimes find it quite hard to express what I am doing, so this is really helpful for me, and others, no doubt. I think your latest creation is heading to the ” wowsers ” department. Especially with different fabric, it will have the “wow” factor. I really like the one piece skirt too…so smart! Great start…if you do the skirt in all one color with multiple pieces you can also highlight the seams with piping or ribbon. Please don’t leave your edges unfinished like the Top Shop one! 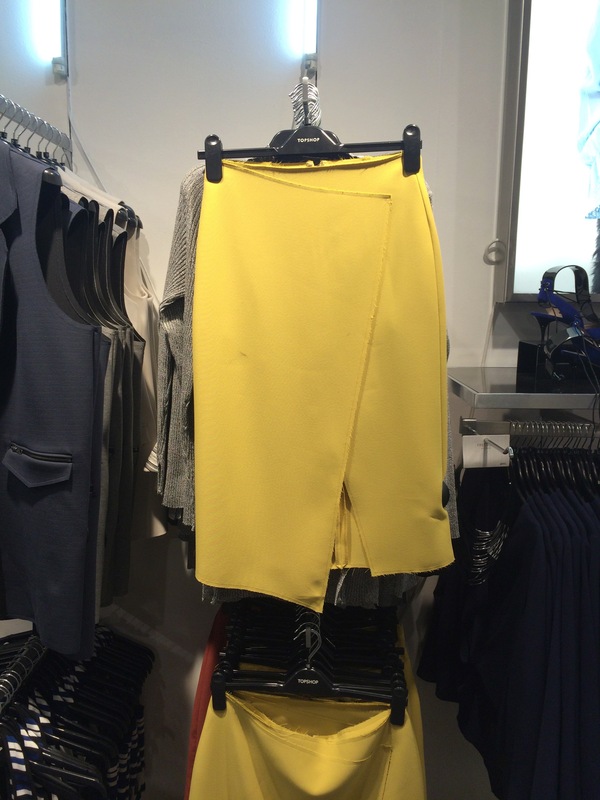 Can’t imagine wearing yellow on the bottom half of a body to enlarge it visually! Ha ha. That is why I didn’t buy it Mrs Mole! Most of their clothes are for the young, tall and very skinny brigade. But sometimes they do have a bit of creative pattern cutting going on, which I am always on the look out for. I do think the ribbon or piping is a great idea. I am going with two colours, but there maybe opportunities for a second (improved. I always improve it the second time) version. Love your skirt and have been noting that Topshop shape around the shops lately. I have the most beautiful vintage rayon in an amazing sunshine yellow that I thought a skirt would be great in – but as a plus sized lady I am now wondering about its suitability , unfortunately yellow next to my face is not a good look! Your ideas would be appreciated. I am a lover of yellow and I do have a yellow leather skirt. If you send me a photograph of you without make up in natural (outdoor) light I may be able to suggest the best yellow for your colouring. My post on yellow is here. My email is kate@fabrickated.com. In terms of being plus sized the lighter and brighter shades do make us look larger than the darker and more muted shades, described here. I hope this helps! Shopping in town on Saturday I saw the top shop unfinished skirt and I’ve been thinking about it today. Defo a fashion forward piece that I’m sure we shall be seeing a lot of in the future. I loved it! Love the colour of the TopShop skirt, but unfinished seams are just lazy and cheap in my book.